Mommy Jane always look for cheap baby clothes but with high quality and in good condition for my Little Angels to wear it. Babies tend to grow up very fast and Mommy Jane always need to replace their wardrobe of outgrown clothes by shopping online or at the stores. To save some money on clothes, Mommy Jane will shop at Carousell. 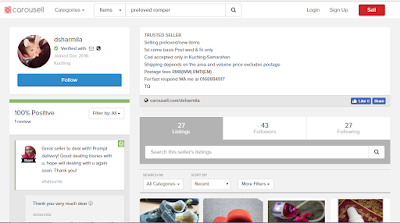 Carousell is a broad online marketplace on the mobile app store that allows us to find whatever we want for at a very affordable price. Last weekend, I went to a big shopping mall to shop for baby clothes for my friend's baby who will be celebrating 1 year old soon. The Gap Romper Original attracts my eyes and I like the quality, the colour and the famous brand, Gap. The price there shown at RM50 and I took out my phone and browse through Carousell App to check whether the Romper was selling there. It is very easy to use. Just choose the category of the item i.e. baby clothes and search for the romper that I look for and to my surprise, Siti Fairuz was selling it at only RM30. She wanted to clear her stock and there are only 2 rompers left for baby aged 12-18 months and 18-24 months. Since my friend's baby going to be 1 year old, I choosed the 12-18 months romper. I can even chat up with the Siti via messaging to negotiate the price of the romper and on the method of collection where I could meet up with her at an agreed upon location to complete our transaction. Since she is staying at Ipoh, I choosed to pay extra RM7 for the pos laju charges. With the price of RM30+RM7 for the courier charges, I had save RM13 for the romper. Imagine when I buy clothes for my 5 Little Angels, I could have save more. 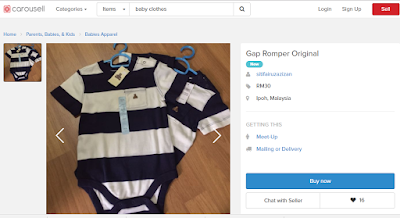 If you want to get your baby clothes too, then do check out the options at their baby clothes. With over 41 million listings, Carousell is one of the world's largest and fastest growing marketplace. Carousell has been ranked as the top Lifestyle and Shopping app in Singapore, Taiwan and Hong Kong. That is the reason why Mommy Jane not only buy clothes, Mommy Jane will look for books & stationery, kitchen & appliances, home & lifestyle, hobbies & gadgets, food & beverages, auto accessories & others items at Carousell in order to get value for money items from variety of items to choose from. 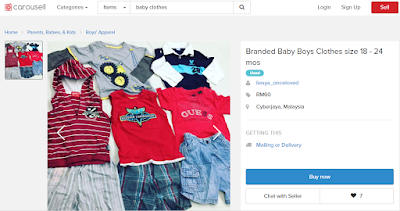 Carousell is not the only place where you can get cheap new and preloved items, you can sell it too to earn some money for unwanted baby clothes. To sell, just take a picture of the item and put a brief description regarding the item and name a price that you feel is fair. Mommy Jane found a preloved romper NB baby cloth at only RM2. The quality looks good and you can search for other items that the seller sell and get it in bulk to save on the postage charges. If you want to get a secondhand baby toys at a cheaper rate, you can get it too at Carousell. I met Atikah who sold his secondhand branded baby's toy. 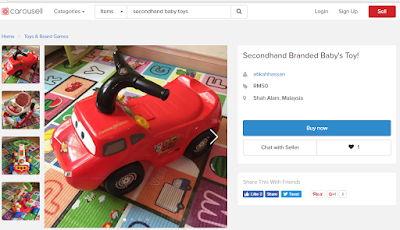 The baby car, the walker and the pusher at RM50 each which is consider cheap because of the quality, brand and most important is, it is still in a very good condition. 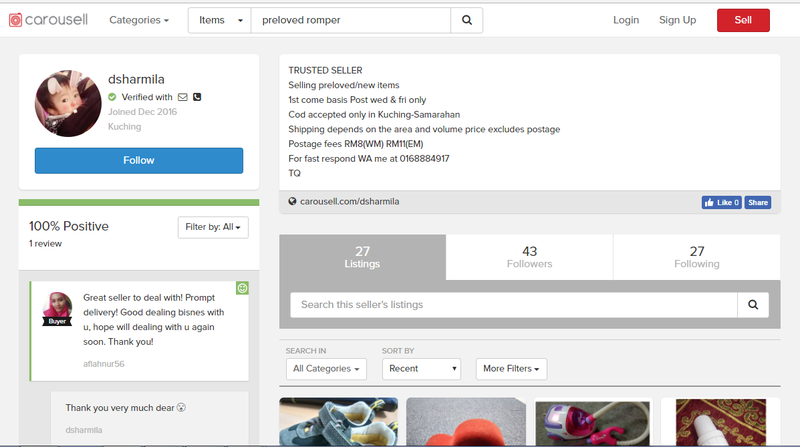 Carousell is a unique App that directly connects the buyer and the seller. It is a broad online market place on the mobile app store that allows everyone to find whatever we want for a very affordable price. It is quick, easy and safe to use where we are buying from our fellow community and supporting each other in the process. Carousell can be dowloaded through iOS or Android and you can visit https://my.carousell.com/ for more information. Do follow them at their facebook page at www.facebook.com/carousell.my for their latest promotions. Being a Carousell user, I can say that Carousell has worked for me. Instead of having to physically go out and spend long hours looking for what I want, I can sit comfortably at my sofa and scroll through the list of goods that Carousell has to offer. My meet-ups with sellers or buyers have been completely professional as all of them are well-mannered. So, if you want to get cheap and quality baby clothes, do check it out from the Carousell. Hope all of us can save more for a better quality of life. Oh yes. I heard about Carousell before but didn't get time to browsing around. Since I have a baby, I guess I get a reason to look for a pre-loved clothes for him with cheaper prices, ya. Nisa, baby grown very fast and preloved clothes could help us to save more. I love Carousell too! Have managed to sell a few things there. Rawlins, great to hear that. I sold my items there too. Iman, l love it too since l can save more too. Dr, l am a seller too. thanks! 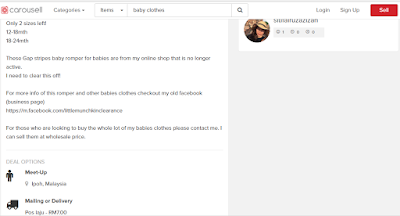 i was looking for cheap baby clothes. thanks for recommendation. I have not personally purchased from Carousell before but I have to agree that they products sold are really cheap! 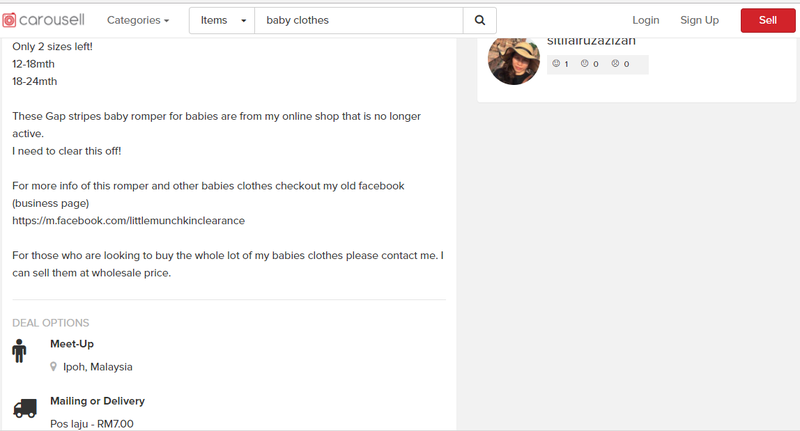 Don't need baby clothes but the items are just as wonderfully priced! Emily, it is so convenient to purchase online now. Yup there are many thing we can buy and sell at carousell. Kindly of like it there too. Tenku, you found the right website. Happy Shopping. 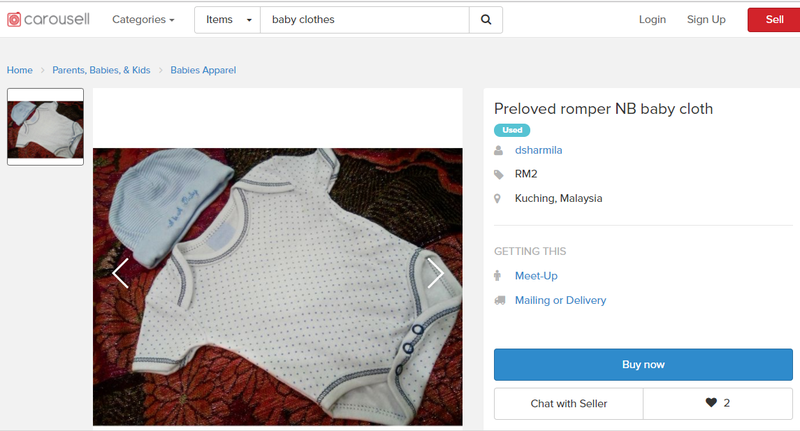 DiDnt know that Carousell also got baby clothes nowadays. Will recommended it to my friends! U know working mama need to save money for their education too! Maple, l definitely agreed with you on this.